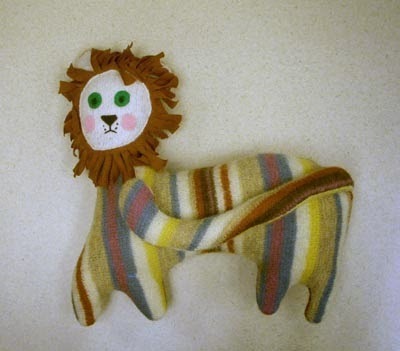 This is your chance to win Karen Heenan’s unique soft-sculptured lion toy. All you have to do to win is go to her website and leave a comment for her Monday, July 14th through Wednesday, July 17th. The winner will be chosen randomly on Thursday, July 18th. While you are there, take time to read Karen’s blogs, visit her On-line Yard Sale, and then check out her Etsy Shop, Useful and Beautiful. I am just getting to know Karen, but have really enjoyed her writings. They are humorous and I love her ability to cut-to-the-chase and tell-it-like-it-is manner, not like my Pollyanna-Jane style that is often sugar-coated. They make me laugh and I appreciate her frankness and honesty. Her crafts are very fun! She talks about collecting, recycling, and re-fashioning, which is very creative! Her variety of wares in her Etsy shop includes: quilted potholders, soft sculptured unique animals, children’s clothing, women’s apparel, handmade Christmas stockings, decorator pillows, purses, bags, and accessories! She has it all and at reasonable prices as well! I loved her On-line Yard Sale items too!! Unlike myself, Karen is a woman of the world and shares her travels as well as classes that she takes, her chickens and gardening with her readers! My world just got a lot bigger! Thank you Karen and thank you too for being our guest Common-Thread Give-Away Artist for July! Good luck to our readers and enjoy getting to know Karen as I did! Labels: Common-Thread Give-Away for July; free soft sculptured toy; Karen Heenan.